Are you at the point that you don't care about winning a patch and don't even get it from the DR if you do win it? Well here is another option for you.......you can choose a coupon for an entry into a drawing for a trip to Vegas instead. So for having a rackless night, 8 on the break, 8 break & run, 9 on the break, or 9 break & run, you could be VEGAS BOUND! 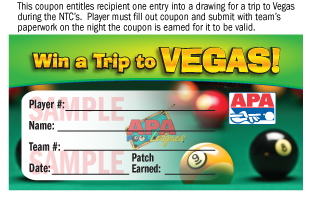 So, you have two options if you earn a patch......you can either get the patch from the DR OR you can get a coupon for an entry into the drawing for a trip to Las Vegas during the APA National Team Championships (flight & hotel for 4 days/3 nights). 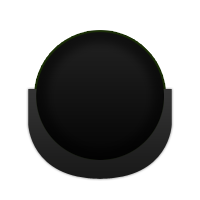 The number of entries in unlimited - you just have to earn them in the matches you play. If you choose the coupon instead of the patch, fill out the coupon that night with the required information and turn the coupon in with your team's scoresheet so that it can be validated. See more details for the in By-Law #35. We will give away one trip to Vegas per 1000 coupons we receive. In addition, there will be a drawing at the end of each session for additional prizes such as APA t-shirts and other swag. But don't worry.......if you don't want the coupon for the entry into a drawing for a trip to Vegas, you can still get a patch.